Road signs are used to bring order to our roads so that we can go about our business in relative safety with minimum delay. Without them chaos would reign and our daily drive would be rather more dangerous. 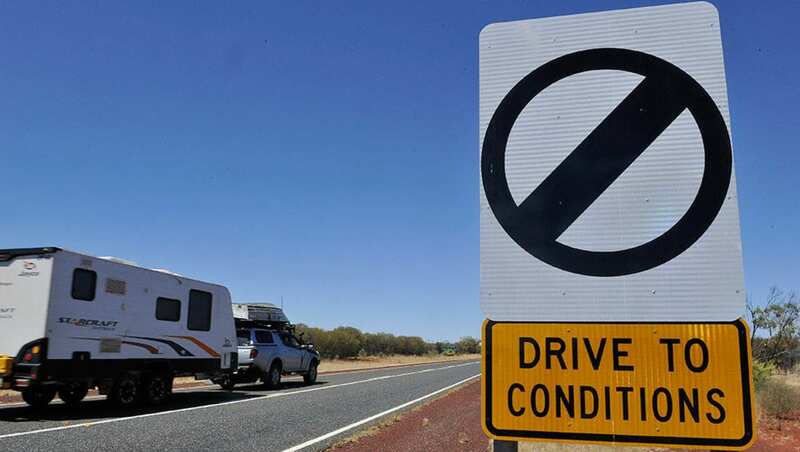 Road signs in Australia are a state responsibility, but they conform to national guidelines, so that are in effect the same right across the country. At the same time the states and local councils can use signs that relate to particular situations in their areas, and you need to be alert to them. Even when local bodies erect signs they still follow the general theme of the national guidelines. With the overall consistency of signs throughout the country we can feel confident to drive anywhere in the country and still recognise and understand the traffic signs in use. 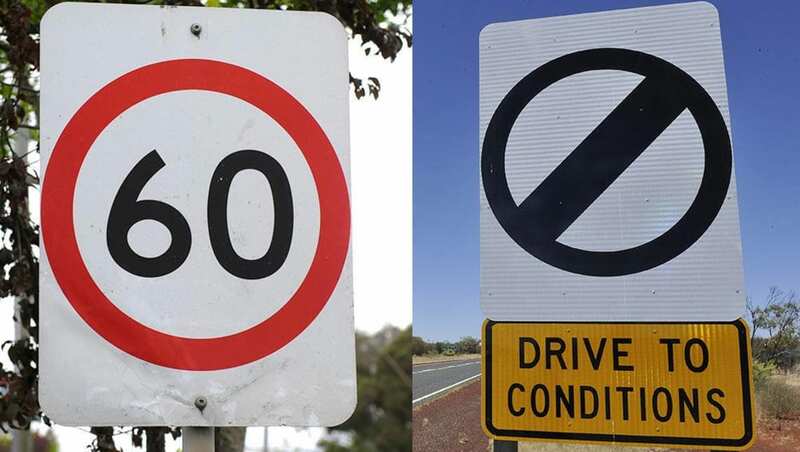 There are three types of road signs in use in Australia: Regulatory signs, Warning signs, and Information signs. Speed limit sign and unrestricted speed sign. Stop, Give way and Approaching a roundabout signs. From left: No right turn, Right hook-turn, Keep left sign. The most ignored traffic sign in Australia. 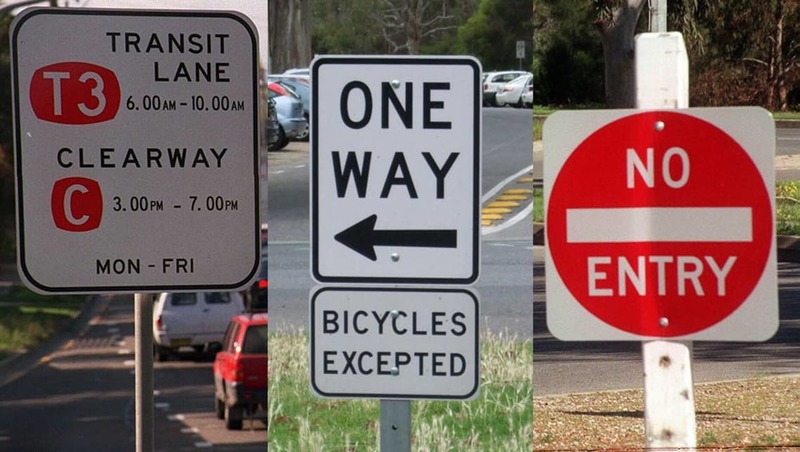 From left: Transit lane & Clearway, One way sign, No entry sign. Regulatory signs relate to the rules and regulations that roadusers must obey. Failing to do so can result in licences being cancelled or suspended, fines, or receiving demerit points. A speed limit sign posts the MAXIMUM SPEED you are permitted to drive in that area. Speed limit signs are rectangular with the posted maximum speed in black inside a red circle on a white background. 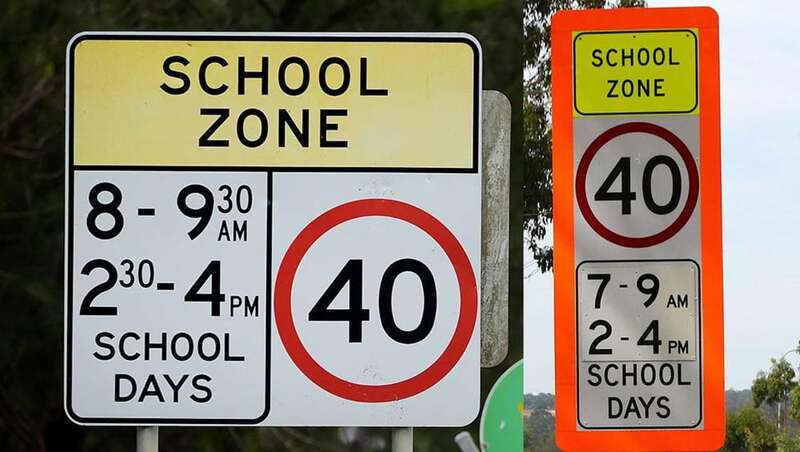 Lower speed limits, generally 40 km/h, apply in school zones for the safety of students. They apply at specified times during the day, usually between 8 am and 9.30 am when students are arriving in the morning and 2.30 pm and 4 pm when they’re leaving at the end of the school day. School zone zones can be square or rectangular in shape with sections indicating the speed limit, which is shown in black inside a red circle on a white background, together with the times and days the speed limit applies, also black on a white background, and headed by a yellow ‘SCHOOL ZONE’ warning in black on a yellow background. The fixed school zone signs are often accompanied by flashing speed signs, with the speed limit in white inside a flashing red circle. 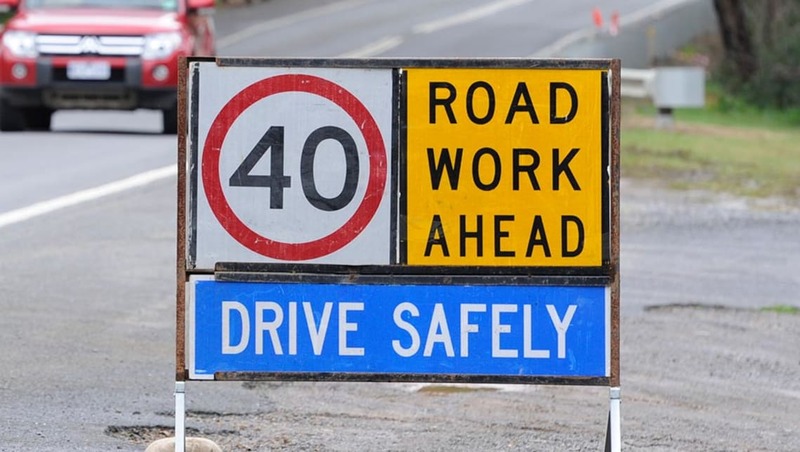 For the safety of workers temporary signs indicating reduced speed limits are posted at sites where roadworks are taking place. Like regular speed limit signs speed limit signs at roadworks must also be obeyed. You must come to a complete STOP at a stop sign, give way to other traffic, before proceeding with caution when clear. 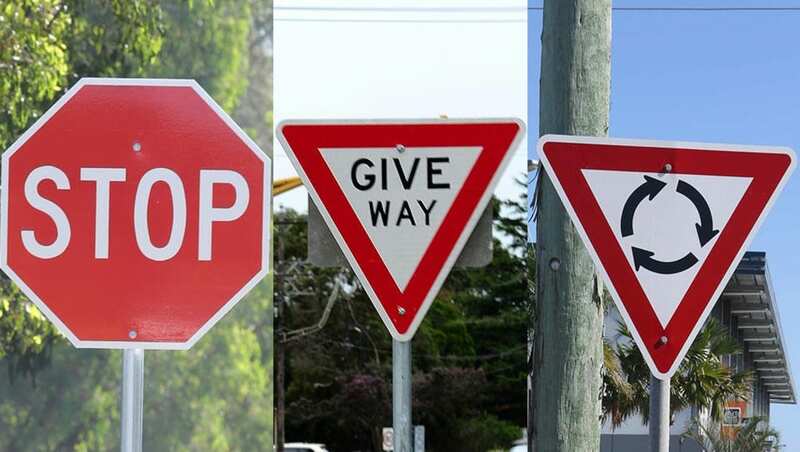 Stop signs are octagonal in shape with the word ‘STOP’ in white on a red background. You must slow and be PREPARED to stop, give way to other traffic, before proceeding with caution when clear. Give Way signs are triangular in shape with the words ‘GIVE WAY’ in black inside a red triangle on a white background. You must be prepared to give way to all vehicles in the roundabout. The sign telling you that a roundabout is coming up is triangular in shape with three black arrows forming a circle in a clockwise direction inside a red triangle on a white background. In some situations turns are banned for safety and to facilitate traffic flow. They could be left turns, right turns, or U-turns. The signs indicating a particular turn is banned are rectangular with a black arrow in the direction of the banned turn inside a red circle on a white background. They can also have the words, for instance ‘NO LEFT TURN’, spelling out the particular turn that is banned. In some cases turns are only banned at certain times of the day. When that is the case the sign also has the times when the turn in banned. 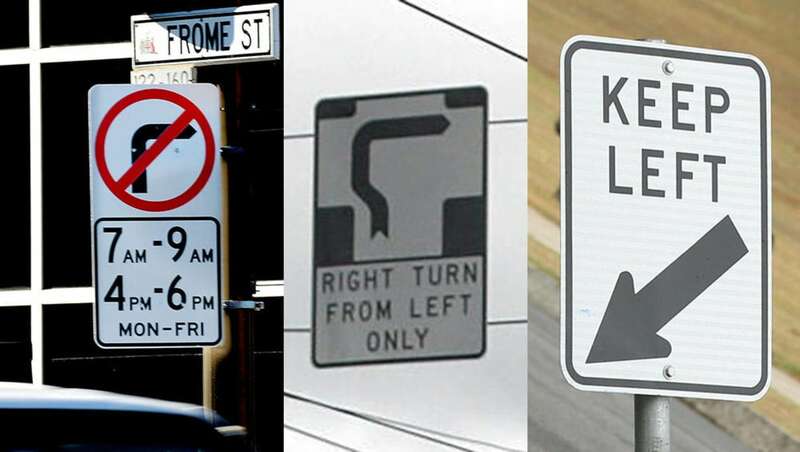 If there was an award for the most confusing road signs in Australia it world have to go to Melbourne’s so-called ‘HOOK TURNS’ at a number of intersections in the city CBD and require right turns to be made from the left lane so the flow of trams isn’t impeded through the intersection. To make a right turn at the intersections where HOOK TURNS are required you must drive into the intersection in the left lane indicating your intention to turn right and then come to a halt and wait until through traffic clears when you can safely complete the turn. HOOK TURNS are indicated by a rectangular sign with a directional arrow and the words ‘RIGHT TURN FROM LEFT ONLY’ in black on a white background with a black border. You are required to stay to the left of a ‘KEEP LEFT’ sign. It is rectangular, with the words ‘KEEP LEFT’ and an arrow pointing to the left in black on a white background with a black border. 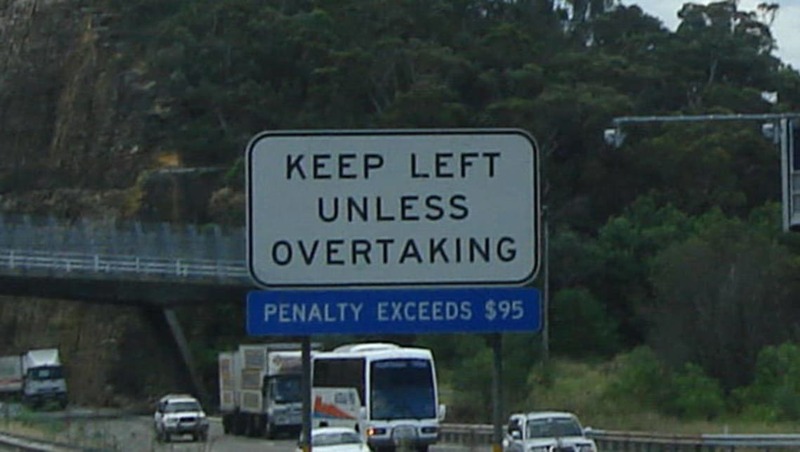 The most ignored traffic sign in Australia must be the one telling drivers to stay left unless they are overtaking. They’re black and white, and seen everywhere. Do not enter a street or road when you see a ‘NO ENTRY’ sign. It is most likely a one-way street and you would be going against the traffic flow. It is rectangular, with a white dash inside a red circle above the words ‘NO ENTRY’ in black on a white background with a black border. The ‘TWO WAY’ sign tells you that you are driving on a two-way road and traffic will be coming at you from the other direction in the right hand lane. It is rectangular with opposing arrows and the words TWO WAY in black on a white background with a black border. Indicates that the traffic flow is in one direction only. A ‘ONE WAY’ sign is square with the words ONE WAY and an arrow in the direction of the permitted traffic flow in black on a white background with a black border. To aid traffic flow on freeways or motorways at peak times lanes can be dedicated to cars carrying three or more occupants. The signs denoting a transit lane are white with the words Transit Lane in black above an indicator of the number of occupants needed before you can use the transit lane in white on a red background. Also included in the sign are the days and the time of day the transit lanes are used. It’s usually weekdays, either in the morning or afternoon. 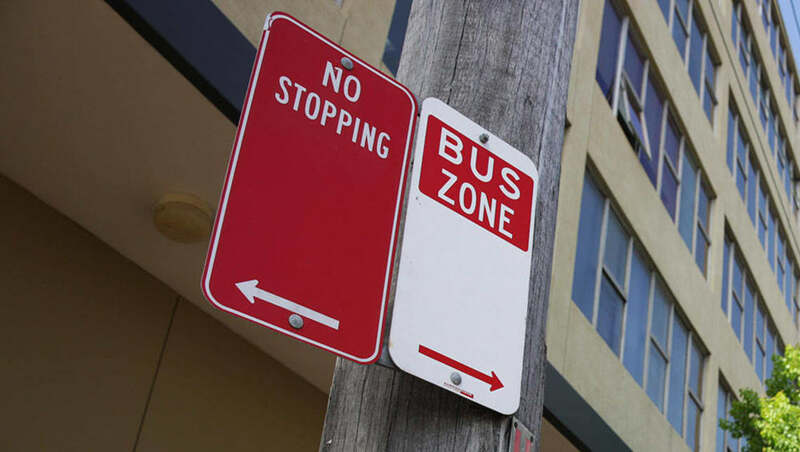 No Stopping and Bus Zone signs. 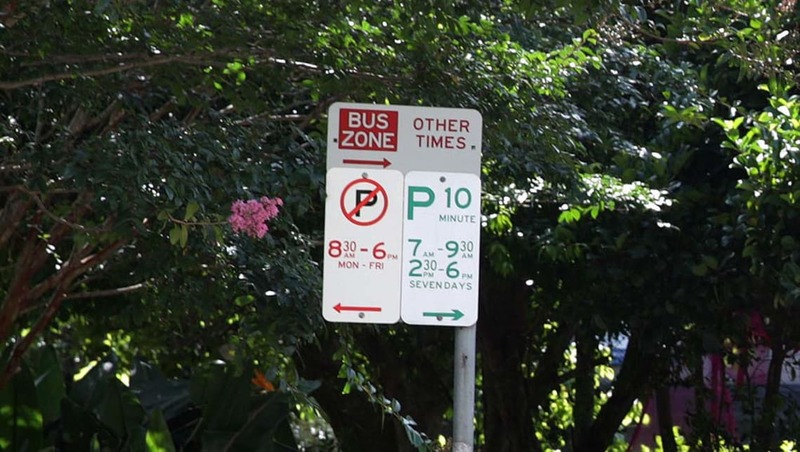 Typical time-conditioned signs in Sydney, including bus-zone, 10 minute parking and no parking zones. 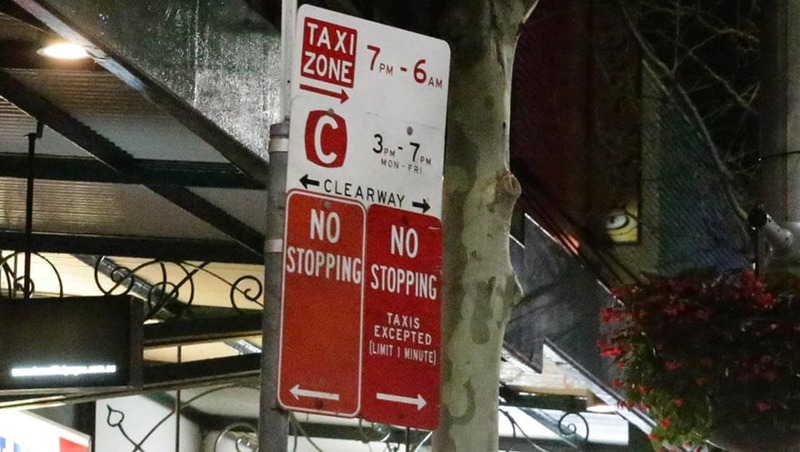 Time conditioned parking in Sydney including Taxi Zone, Clearway and No Stopping. Parking signs are also designed to aid traffic flow and to give everyone fair access to a parking spot when they need it, albeit for a limited time. Parking signs are rectangular, either vertical or horizontal, with the time permitted to park, for instance 2P for parking permitted for two hours, in green on a white background. In some cases the parking limitations only apply for certain times on particular days, and that information will also be shown on the sign. A ‘NO PARKING’ sign tells you that you cannot park within the limits defined by the sign. It is a rectangular sign with a ‘P’ in black inside a red circle with a diagonal red line through the ‘P’ on a white background. It also has an arrow indicating the area of the parking ban. If the parking area is a metered one the sign will also include ‘METER’. In some case the parking ban only applies on certain days and at certain times, and these will be spelt out on the sign. A ‘NO STANDING’ sign means that you cannot stop, even briefly, in the area defined by the sign. It is rectangular with the letter ‘S’ in black inside a red circle crossed by a diagonal red line on a white background. A red arrow will point to the affected area. Parking can also be banned in areas limited for business use, such as a LOADING ZONE, BUS ZONE, TAXI ZONE, or a zone that requires a permit. These signs are rectangular with a white background and a red box in which the particular use of the zone is show in white. Clearways are declared in areas of high peak hour traffic to facilitate the traffic flow. They’re white with the word CLEARWAY in black, as well as the letter ‘C’ in a red box, and the days and times the Clearway is in use. The sign often includes an illustration of a tow truck removing an illegally parked car to graphically show the consequences of not obeying the restriction. Permanent warning signs featuring animals that may cross the road. 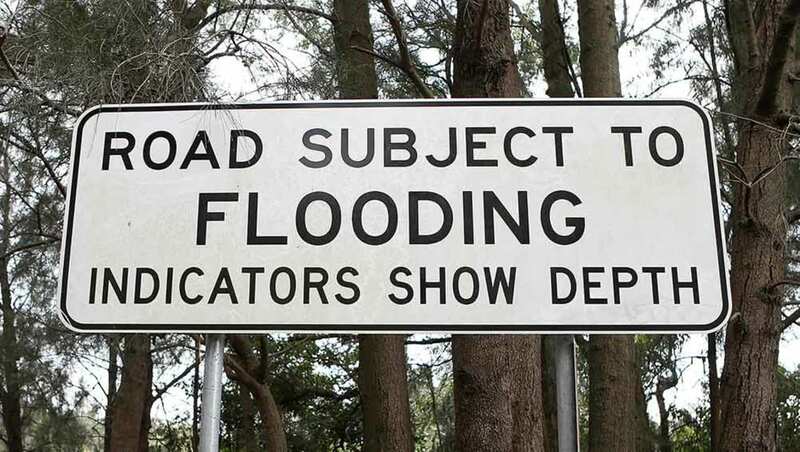 Information sign indicating an area subject to flooding. One of the most stolen street-signs in the country. Warning signs are there to warn you of an upcoming hazard requiring caution. When facing a warning sign, the message is clear, take care. They are diamond shaped, with a black graphic illustrating the hazard on a yellow background, and could warn you of a blind crest, a dip, a steep descent, a T-intersection, traffic lights, a tight curve, a narrow bridge, a road hump, a pedestrian crossing, or a tricky series of bends. Speed advisory signs telling you of the maximum safe speed you can expect to negotiate a sign-posted curve are also commonly used. Warning signs are also displayed at locations where traffic has to merge, say from three lanes to two, or two to one. The graphic will show an arrow/arrows continuing on where traffic is unaffected, and one coming to a dead end where you have to merge in to an adjacent lane. In some cases, where lanes are changed at particular times of the day, for instance in peak hours, overhead warningsigns are used. A red cross is used to tell you the lane is closed, a green arrow tells you it is open to traffic. Temporary warning signs are erected to warn drivers they are approaching a hazard that is currently requiring extra caution. They are used to warn of roadworks coming up, flooded roads, fallen trees, or maybe even a crash scene. They are mostly yellow and black, but could be orange and black, or could be a red triangle if it’s an incident on the road. These are there to inform you of relevant information on your journey. They’re designed to make it as easy as possible to get to our destinations with minimum delay. They might point you in the right direction, tell you how far you are from your destination, tell you what road or highway you are on, and the name of the street you are seeking. Street signs and place names are the most stolen signs in Australia, usually because they have a common connection to something else in the community. 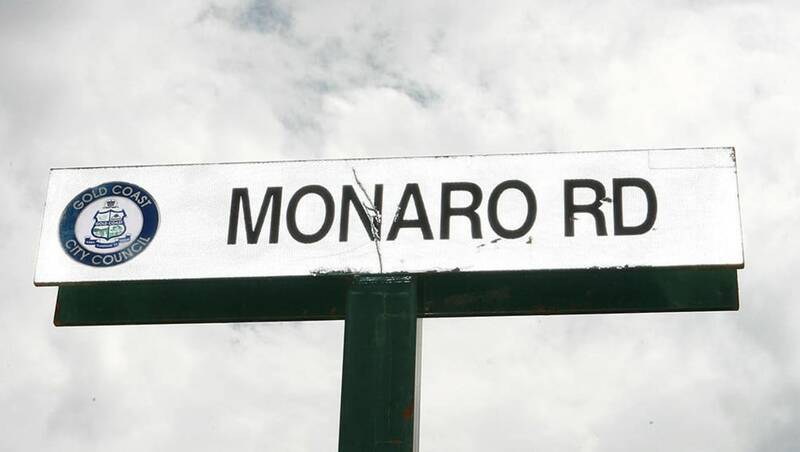 Signs including ‘Monaro’ are some of the most stolen. A LOW CLEARANCE sign is a warning that you are approaching a low bridge or an overhanging obstacle. 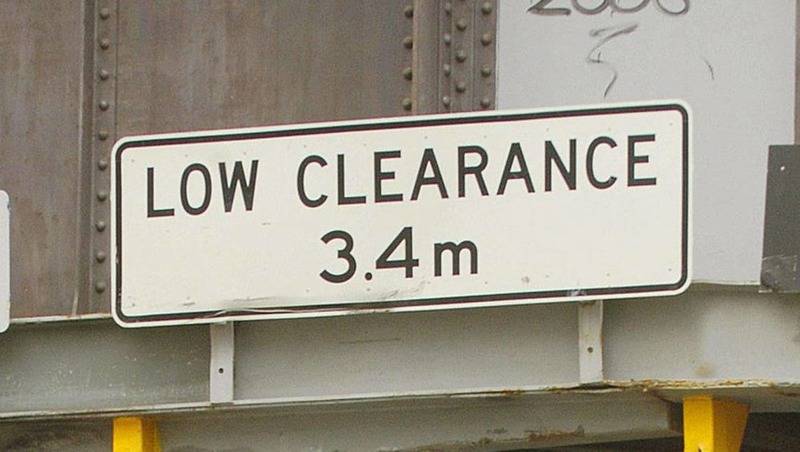 The sign is usually white with 'low clearance' and the actual clearance in metres in black. 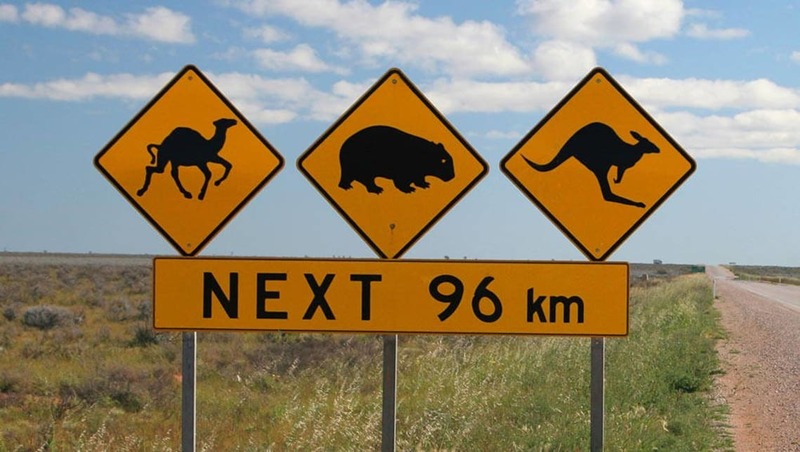 Do you find any of Australia's road signs confusing? Tell us what you think in the comments below.